Unsigned binding attributed to Sarah Wyman Whitman (Allen, Gullans, 1994). Quarter ungrained cloth with green rib-grain on sides. 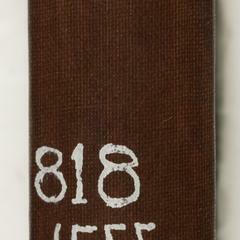 Brown ungrained cloth on spine. Brown stamping on front. Gold stamping on spine. No decoration on back. Green coated endpapers.